Gil Noble loved him some Harlem. He loved the way Harlem talks, as when Chuck Berry rushed back onstage in his lounge slippers after a break at the Apollo Theater in the '60s and heard a rock 'n' roll fan yell upstage: "You need you some shoes, Chuck!" Noble loved the way Harlem laughs, spins jazz and cries as it perpetually stares down death. He loved how Harlem always gets down with life, a life vigorously defended on the streets over the years by such activists as Adam Clayton Powell Jr., Eddie "Porkchop" Davis, Carlos Cooks, James Baldwin, John Henrik Clarke — and most of all, Malcolm X. Growing up with these prophets teaching hope and with Harlem making jazz, Noble, who died on Thursday following a massive stroke last July, was 80. He dedicated his life's work to preserving this rich American culture as a broadcast journalist, TV host and documentary maker. For more than four decades, Noble was a potent force in New York television, co-anchoring WABC-TV news early on — following the urban riots of the 1960s — as he produced and hosted one of the first black public-affairs programs, Like It Is. His deft chronicling of current and historical events and personalities attracted a fiercely loyal following that occasionally rose up to defend the show from forces seeking to silence Gil Noble. As did other African-American achievers of his era, Noble launched his career late and not without struggle. At 6 feet 5 inches, the handsome Harlemite earned his way early on as a model, marrying his model bride Jean, in Moscow in 1959, with the U.S. ambassador in attendance. Settling down in Harlem with a young family, he worked as a bank clerk and part-time pianist with his Gil Noble Trio as he earned a degree from City College of New York. He was tempted by broadcast journalism after taking a course in announcing school and working a stint of radio and TV voice-overs. After "striking mud" at a few stations, the 30-year-old prospect was hired in Harlem at white-owned, black-oriented WLIB radio by news director Bill McCreary, a broadcast pioneer who later moved to TV. Initially, Noble shunned the lecturing of Malcolm X as a plague out on 125th Street; after Malcolm's assassination, however, he doubled back to the laser-sharp message with profound regret that he had avoided in the flesh what became his single greatest influence in spirit. "Malcolm changed my life," he would say fondly and often. "[His] autobiography did more than acquaint me with his life — it motivated me to study history. Malcolm made it clear that his power and effectiveness came from knowledge. "My presence in television is the direct result of the black struggle," Noble wrote in his 1981 memoir, Black Is the Color of My TV Tube. "But for the social upheaval of the '50s and the '60s in America, I believe that I would not now be working in television as a news correspondent, weekend anchorman, producer and host of a one-hour program." In the wake of the urban revolts in many cities following King's assassination, blacks pressured TV stations for inclusion on the airwaves that supposedly belonged to all of the public. Replacing their weekend morning diet of Tarzan movies, Hour of Power and The Three Stooges, several TV stations scheduled black-oriented public-affairs shows that mainly dealt with local issues, personalities and culture. In 1968 Noble began splitting his duties as WABC-TV news reporter and co-host with actor Robert Hooks of Like It Is, a one-hour, weekly magazine show. After changing the title from The Way It Is, the duo scuttled the original rock 'n' roll theme song and persuaded the white managers to hire jazz saxophonist Jackie MacLean, Noble's childhood friend, to compose a jazz theme. Hooks left to star in the crime series N.Y.P.D., and Noble hosted the magazine show under producer Charles Hobson, who oriented the format toward strong black themes and documentaries on significant heroes. Noble teamed behind the camera with graphic artist and pan-Africanist Elombe Brath; Paul Robeson's granddaughter Susan Robeson, a researcher; and historian-scholar Paul Lee, who, with his brother Sunni Khalid, played a key role in producing some of the early specials focusing on Malcolm X. On camera, Noble rotated notable co-hosts such as Carol Jenkins, Felipe Luciano and Geraldo Rivera. When, in the early '80s, the local news shows began infusing chitchat and monkeyshines into the broadcasts, Noble's anchoring duties were reduced because he refused to clown around on air. Relegated to weekends, he was finally assigned full time to produce and host Like It Is by the late '90s. This one-hour weekly show proved to be a platinum setting for Noble's talent as a provocative journalist, video historian and unapologetic "race man." During some 43 years on the air, Noble used the long-form format of Like It Is to create a treasure trove of exclusive footage on cultural and political leaders such as Paul Robeson, Frederick Douglass, Martin Luther King Jr., Adam Clayton Powell Jr., Muhammad Ali, Bill Cosby, Fannie Lou Hamer, Dizzy Gillespie, Marcus Garvey, Max Roach, Harry Belafonte, Sarah Vaughn, jazz pianist Erroll Garner and educator Adelaide Sanford. Before the invention of VCRs and DVRs, devotees of Malcolm X would reliably skip church on his birthday and assassination weekends in order to watch Noble's updated specials on the national Harlem icon. In addition to these tall trees and the mountaintops, Noble dared take his cameras to the gritty and desperate bowels of the city. In 1981 he produced an extraordinary exposé on the scourge of heroin addiction gripping Harlem. "An Essay on Drugs" was his stunning TV account of this scabrous netherworld, featuring up-close scenes of street addicts blistered with pus sores surveying one another's necks, groins and underarms for a clear, remaining vein suitable for injecting a syringe of liquefied heroin. "Like It Is provides more new and valuable information and analysis than all the local news shows on all the local channels put together," wrote Nat Hentoff in the Village Voice in 1982, when the show was seldom the focus of mainstream critics' columns or reviewed for the treasure that it was. Nonetheless, Noble garnered seven Emmys, five honorary doctorates and several lifetime achievement awards, and he was most proud of the more than 650 plaques, citations and crystal-glass prizes the community awarded him over the years. He did not make his mark without controversy. In the early '80s, several influential Jewish leaders pressured WABC-TV, demanding punishment for a discussion Noble aired on the Lebanon crisis. They argued that the panel discussion was "imbalanced" and "inaccurate." Dozens of supporters were called on to picket the station to "Keep Your Hands Off Gil Noble." As protesters worked the streets, an ad hoc committee of black leaders worked the suites to block the station manager's threat to ban Like It Is from addressing any international issues — including uprisings in the Caribbean islands of Jamaica, Haiti and Grenada, and the revolutions sweeping much of southern Africa at the time. On a bleak, wintry night in Harlem, some 700 "friends of Like It Is" listened with their jaws tight at the Abyssinian Baptist Church as the Rev. Calvin O. Butts read a response from the station manager. The letter from WABC-TV Vice President William Fyffe promised the committee (novelist John O. Killens, City College professor Leonard Jeffries and others) that "In essence, the [Like It Is] format will continue as in the past." Assured that WABC-TV had not yielded to the Jewish leaders' pressure to curtail if not altogether silence their treasured Voice of Reason, the Harlem crowd bundled up and strode defiantly out onto the boulevards, in step with that Leadbelly blues song: "Keep your hands off of him … he don't belong to you." 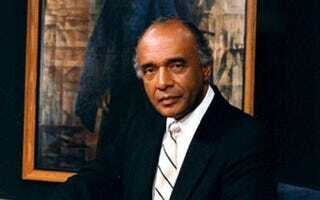 Brother Gil Noble will always belong to Harlem. Les Payne is a Pulitzer Prize-winning reporter who appeared with Gil Noble on Like It Is many times over the years. Editor's note: This article has been updated to reflect the correct surname of Sunni Khalid.